Like other readathons, this one invites the public to participate! Readers are encouraged to sign up in advance for 15-minute segments. 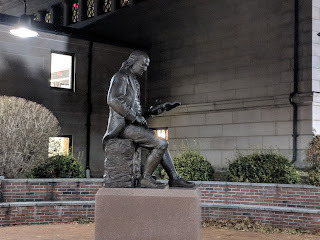 Commencing when the library opens at 9 AM on January 17, readers will share the words of Ben Franklin with anyone interested in dropping by for all or part of the event. It is expected that the reading will be completed by the time the library closes at 8 PM. Water and other refreshments will be available for readers and audience alike." Event Timing: January 17, 9:00 a.m. to 8:00 p.m.